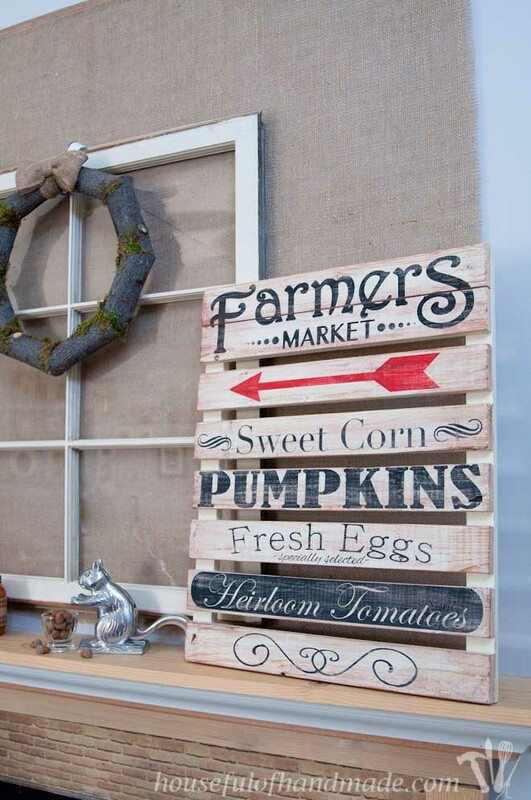 The whole mantle started with my farmer’s market mini palette sign. 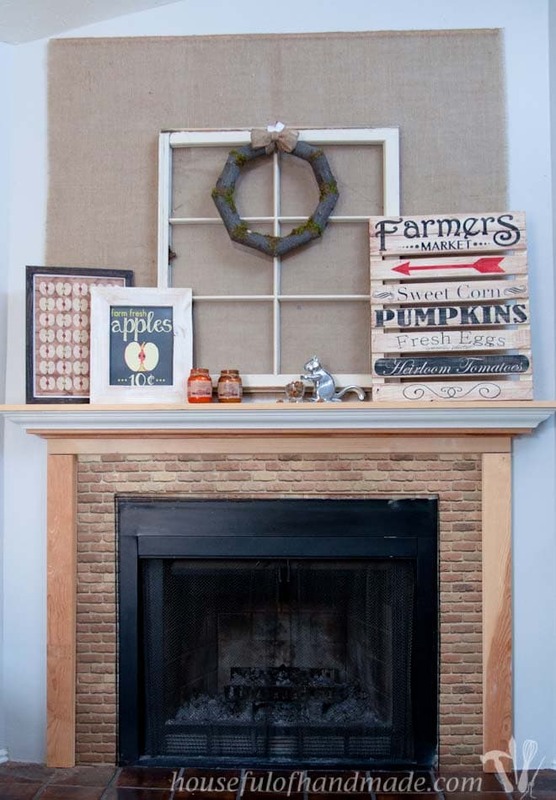 I love that it adds some rustic fall charm to the mantle without having to start with the pumpkins. Now, I need to clarify that I LOVE pumpkins, but I use pumpkins in my Halloween and Thanksgiving decor. So if I added it to my early fall decor, I would have pumpkin decor in my house for over 3 months. Even I would get bored with that. So I took the farmer’s market theme and ran with it! I kept my fall mantle color scheme pretty basic. I have a turquoise, red and yellow color scheme in my living room with light gray walls, and try to make my decorations blend in to that instead of clashing. I focused on the natural creams and browns, then used a little bit of black for dimension. I added a few sparks of red with the arrow of the palette sign and the apple printables. Easy peasy! And it fits in nicely with the whole space. I was so happy with how my printable fall apple sign turned out that I wanted to keep going with the theme. So I made a second coordinating print. I think they work so well together, without being too matchy-matchy. 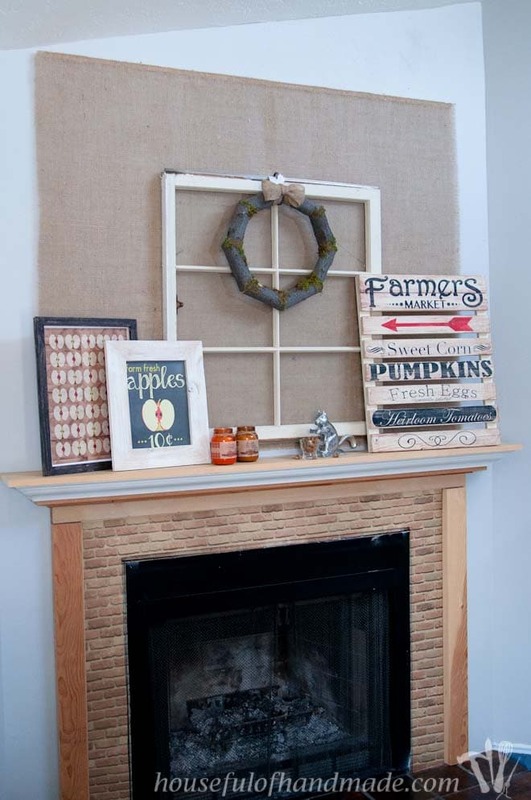 And the 20 minute rustic picture frames that I built make them look so happy on the mantle. To add some height in the middle I used an old window that I got at a local repurposing/antique type store. I know I will be using this piece as an anchor point in most of my mantles. It’s a neutral color and I love the way it looks! Then I hung my woodsy fall log wreath in the middle of the window. Perfection! After I got these main piece up, things felt a little funny to me. I have a challenge with the shape of my wall. It is slanted up on the right side (in case you didn’t notice, I’m not just taking really wonky pictures). I have ceilings that vault up to one side, not to a peak in the middle. And the light color of all the creams wasn’t standing out against the soft gray of my walls, so I had a moment of brilliance. 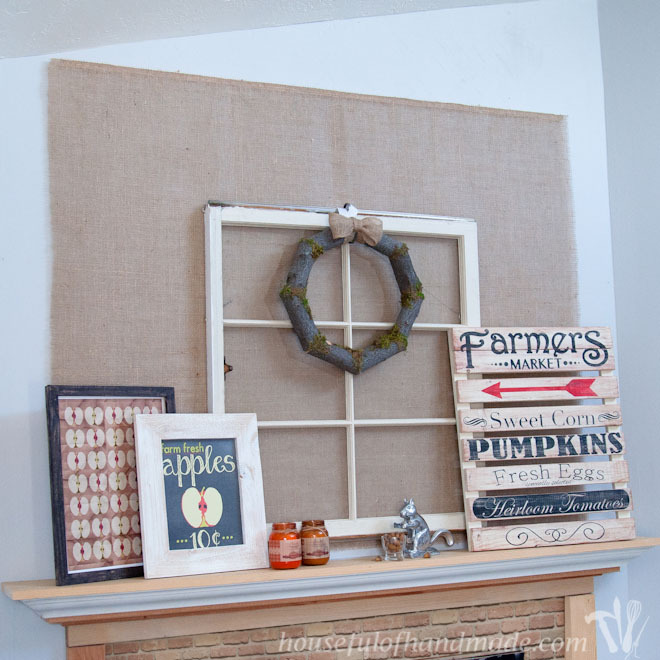 I would add a burlap background to the mantle! 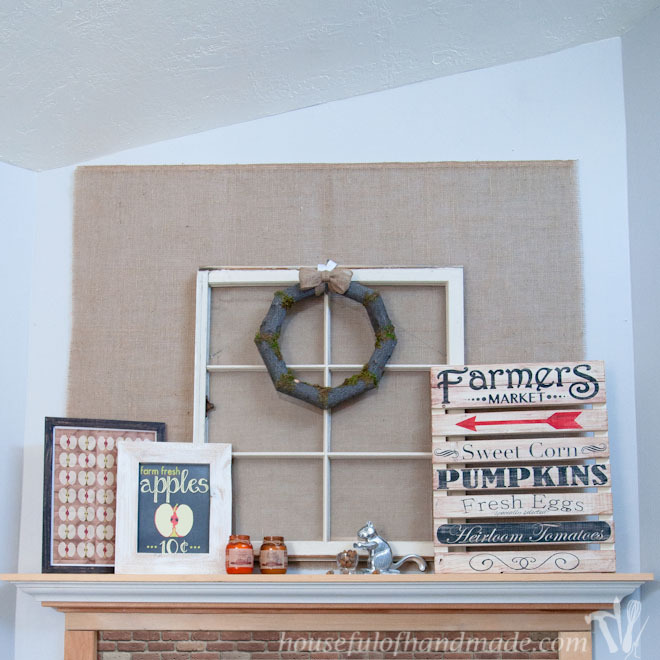 The coloring and rustic feel of the burlap fabric would be perfect. So I got it all cut out to size, then hot glued it to a strip of wood. I ripped a 3/8 in strip off the side of a spare 1×3 with my table saw, so I ended up with a 3/8 in thick x 3/4 in tall strip that I cut to 5′ which is the width of my burlap background. And then I finished it off with a couple sinfully fall scented candles my mom gave me for my birthday last year. They didn’t totally survive the hot attic storage debacle, but they still smell amazing and add a little extra touch of fall color to my mantle. I love this , everything about it is just perfect! Thank you Christine! I love how it all came together. 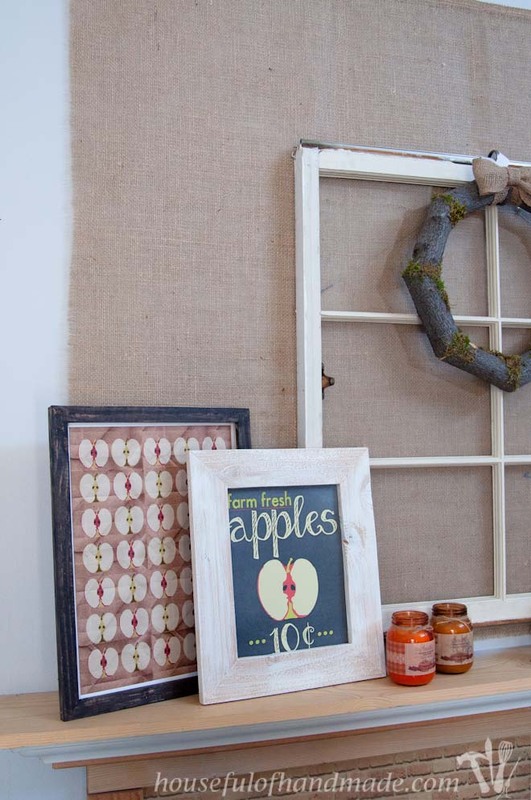 Using the burlap for a backdrop is a genius idea! Really helps spotlight the window frame and all your lovely decor. Just beautiful! And I love your cheeky little squirrel! I’m not wanting to think of fall yet! You are one step ahead of me. I love that wreath? Love your fall mantle, brilliant job. I was going to list what I particularly loved but actually love it all. We don’t tend to do this sort of thing in UK but I’m thinking may be I should… A different mantle for each season. The only one I do obviously is Christmas. 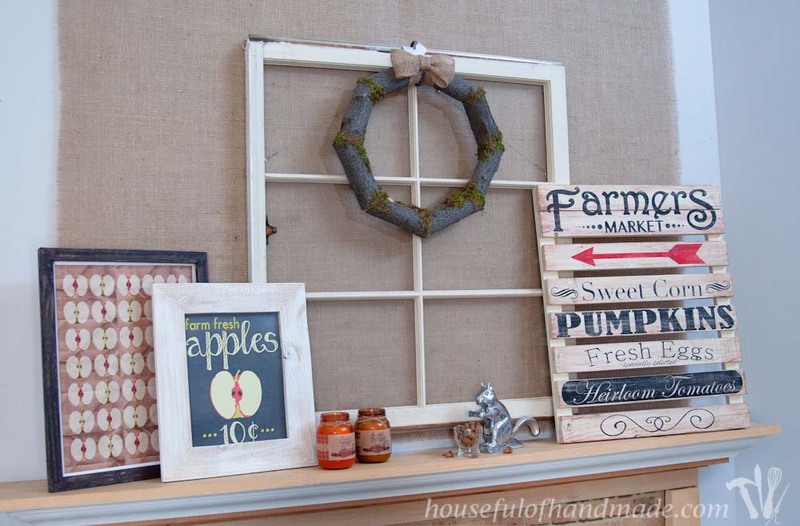 I love decorating for the seasons and the mantle is my favorite way to do that. I’m glad you like mine, I know I’ve had so much fun putting it together. This is so pretty! I was hoping to have a mantel in my new house, but I didn’t get one. I definitely have lots of places to decorate like this, though. 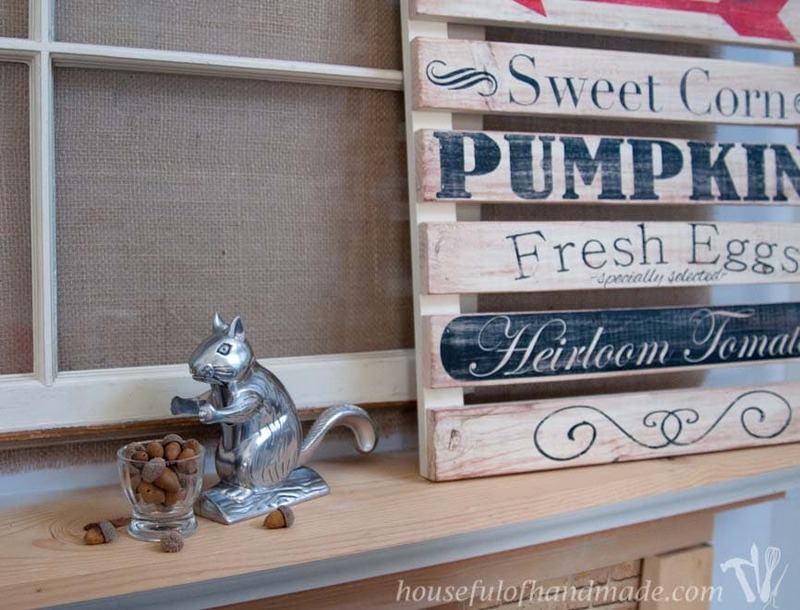 I LOVE the Fall season and am so excited to decorate for it. Your ideas are great! Kati, I think your mantle is perfect just like it is! A little rustic. And that squirrel is just nuts! lol Love a little whimsy in vignettes. Thanks Melinda! The little extra rustic works for now, but I think I need to paint it before Christmas since the rustic doesn’t go as well with that decor. 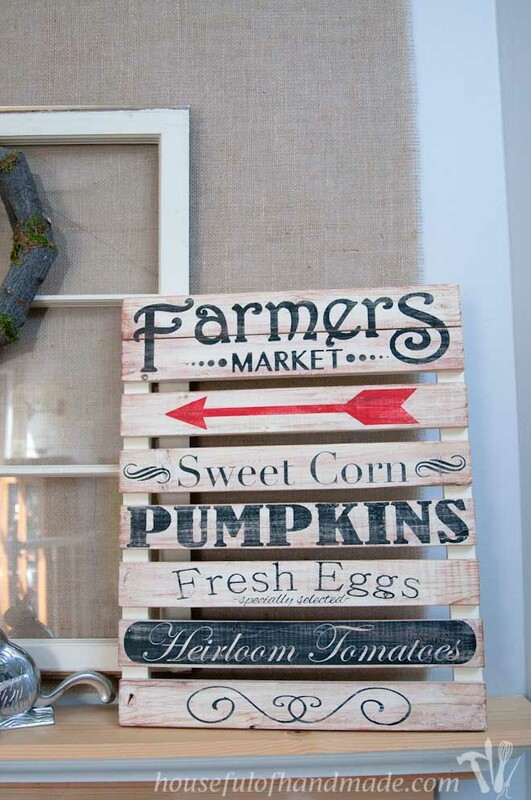 I just adored your Farmer’s Market sign. It goes so great with the mantel. Thank you Jamie! I turned out just how I had hoped.